Florida | "é rayhahn, rayhahn"
Wanting to take a small break from the winter, Mo and I returned to our favorite sunny getaway — Ft. Myers, FL, and specifically Sanibel Island. We’d visited Sanibel (and Captiva) several times on our trips to Florida, but this was our first time staying on the Island proper. We spent four nights on Sanibel, staying at the West Wind Inn. With the weather so nice, besides spending time on the beach and poolside, we took several excursions to the various hiking trails on the island. We enjoyed a nice morning walk along Sanibel River in the SCCF Nature Center‘s collection of trails, seeing a few waterfowl, turtles, and fish, but generally just soaking up the peaceful walk. One highlight was a bald eagle taking off parallel with us about 15 yards out in the clearing alongside the path — the sound of its wings was impressive. Our second hike was at Ding Darling Bailey Tract, which was more exposed than the Nature Center’s trails but included a lot of open water, which lead to more sightings of waterfowl (and gators). We saw several of the larger bird varieties here: Wood Storks, Anhinga, Great Blue Heron, Great Egret, and their lesser brethren like Common Gallinule, Blue Heron, and American White Ibis. On our return to the airport, Mo allowed me a few minutes to wander around Hammond Stadium and “breathe in a little MN Twins baseball” while there, since she inexplicably scheduled this vacation before spring training began. There were a handful of people at the ticket office, and groundskeepers doing their thing. I wandered into the team store by the front entrance and had a nice visit with the employee there…and grabbed a handful of pocket schedules. Not sure when we return to Ft. Myers, but it’s always a good time there. On our yearly trip to Florida, Mo and I stayed again in Ft. Myers at the same Cornerstone Resort condo we were at last year. Thanks to construction along the main drag, Ft. Myers Beach traffic was even more traffic-er than before. Still…no snow, though. And this year, we were joined for a couple days by my (retired) co-worker Ted and his wife Dixie. Apparently attending a spring training game had been on Ted’s bucket list, so I was looking forward to treating him to the March 8th Cardinals vs. Twins game. Unfortunately, it was a Twins split squad game, plus the first day of their minor league camp, so the practice fields normally bustling with the veterans and promising prospects were empty. Still, it was a beautiful day for a game, and we both had our teams on the field. We had seats in the same location I’ve sat in the past trips to Hammond Stadium, which provided a great view of the field. The Cards went on to eventually win 5-3. We saw a little of everything, but we didn’t see Sano and Park homer, like in the other split squad game against Toronto in Dunedin. When it all comes down to it, though, you can’t beat the beach. During our Ft. Myers stay, one thing I could plan on was dropping by the practice facilities, so I picked a nice morning, fought traffic off the island, and hung out at CenturyLink Sports Complex with many other Twins fans. It was great seeing the young ballplayers — Sano and Vargas definitely stand out, size-wise. The new coaches were very involved and hands-on in the drills I watched, particularly Molitor, Mientkiewicz, and Guardado. Alumni were also visible all over, including Carew and Oliva. So, what ballgame did I eventually get to? The only Twins games played in Ft. Myers while we were there were either the home opener, or against the Red Sox at their home opener the next day. There was also a road game against the Tampa Bay Rays at Charlotte Sports Park up in Port Charlotte just over an hour away, though. The ballpark was quite nice, and the weather was sunny and beautiful. When I bought my ticket earlier in the year, I looked for my traditional spot just past the dugout on the third place side, and I found a nice seat in the fourth row with a great view of the action. Only one extra base bit in this game, but overall play was pretty clean and still had its share of action. The Rays ended up winning 2-1. I was able to get three autographs on my program: Max Kepler, catcher Dan Rohlfing, and extra catcher Mitch Garver. Barring a rainout, you really can’t lose when attending a Florida spring training game. Mo and I had been to Ft. Myers, FL on two earlier occasions, although it had been a while, and we decided it was high time to return. Doing things differently on this trip, Mo reserved time at a condo on Ft. Myers Beach, plus we had a bit of time on each end of our vacation to see other areas of Florida. 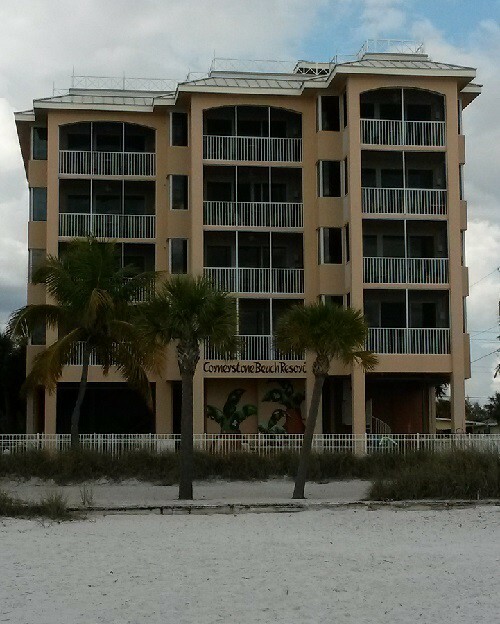 This time around it was more cost effective to fly into Tampa and rent a car there, so we chose to spend our first three nights at the beach in Clearwater, staying at Pier House 60. Unfortunately, we couldn’t choose our weather — the temps were cool and it rained off and on. On one of the days we took a leisurely drive through the south end of the island and down to Ft. Desoto, taking in the military ruins and strolling the park. We walked out on the pier, and there we saw a fisherman reel in this puffer. Our other notable outing in Clearwater was to visit the Florida Aquarium in Tampa…you know, to get out of the rain. Lots of interesting things to see there, and $2 off if you order your tickets online. By the time we leave Clearwater for Ft. Myers Beach, we also leave the rainy weather behind, too. We stayed at the Cornerstone Beach Resort, and our condo was wonderful, with direct access to the beach and a beautiful view of the gulf from our lanai. We found several nice places to eat, and I took the opportunity to take in a Spring Training practice and game (more on this in a later post). Like Sanibel or Captiva islands, there were plenty of shells to be collected here as well. We toasted the sunset each night, the final night being the only one with clouds, and those just at the horizon. We even had some wildlife at our hotel (no, not that kind!) — at the bayside waterfront out back we discovered five manatees, two of which came up to the beach. K was able to touch one, which then rolled over to try and get a belly rub. We didn’t know at the time that interacting with the manatees is frowned upon, and we’re glad the contact never got more than that. Also, besides gar and other types of fish, we saw this stingray along the beach one day. …and an Io moth caterpillar seen at Anne’s Beach. And a couple cool spiders as well; saw three Spiny-Backed Orb Weaver near the water at the Laura Quinn Wild Bird Sanctuary. Also saw three larger Golden Orb Weaver along the Dagny Johnson Key Largo Hammock Botanical State Park hiking trail. I’m not much of a bird watcher, but there were a plethora of sea fowl seen during our vacation — yet, the first bird I saw on our first day at the Keys … a cardinal! Go figure. For one week in mid-January, our family took a much-needed respite to the sunny climes of the Florida Keys. Time to post some pics! We rented a car from the Ft. Lauderdale airport, and set up camp down at our hotel in Key Largo. One of the first things we did was to visit the Laura Quinn Wild Bird Sanctuary just down the road from us. Saw several sea birds, owls, raptors, as well as the circling turkey vultures and a few pelicans on the shoreline alongside the sanctuary. We spent some quality time at Sombrero Beach in Marathon; we were surprised at the lack of nice beaches in the Keys, but really there’s more snorkeling, scuba, and fishing done there than hanging at the beach. The water temp was quite comfortable. The Portuguese Man-o’-War were out in force, with a handful of softball-sized ones washing up on shore, their tentacles bright blue. One morning we got going early and went to Theater of the Sea in Islamorada. We arrived just as it opened, and had practially a private tour and bird show. We enjoyed seeing all the animals there, and the cooler weather that day made for light crowds. Mo and I spent one morning putting in some road work on the trails at Dagny Johnson Key Largo Hammock Botanical State Park. It was a very peaceful hike along three miles of tree-lined pathways, although we did a little backtracking because the recent high tide left a couple unpassable spots among the mangrove scrub on the south end. We saved Key West for our last day, when the island was less busy. It’s a 2-hour drive from where we were staying. There is a ton of interesting history there, and we wished we could have spent more time to see the architecture and visit more of the shops. It was a wonderful time of relaxing and soaking in the warm weather and great seafood. I’ll post some wildlife pics in my subsequent vacation post.